Hello, readers of DrawingForAll.net! 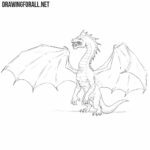 Today we continue the theme of the dragons on our website, a new drawing tutorial on this topic is ready for you. 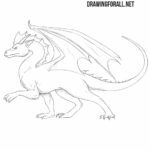 On our website you can find drawing tutorials on how to draw a dragon or how to draw a Toothless from How to Train Your Dragon. And now we present you a drawing tutorial on how to draw a Chinese dragon! 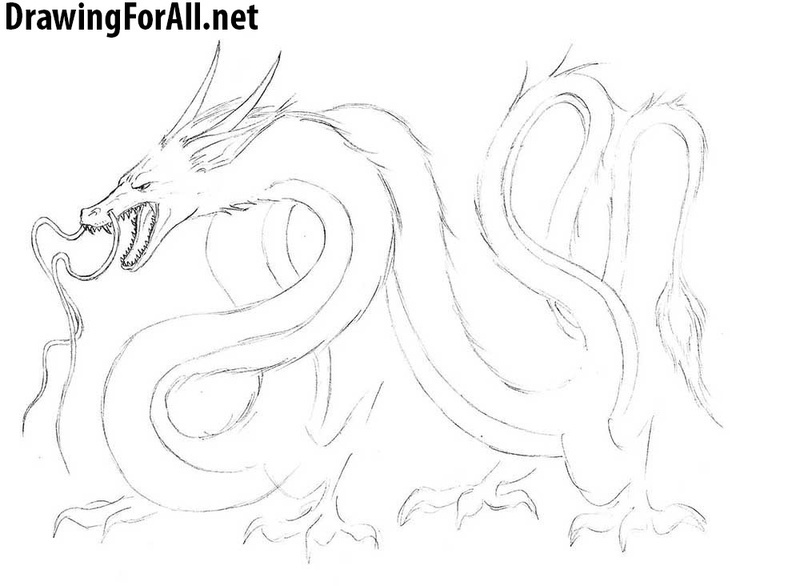 If you would like to learn how to draw a Chinese dragon, you definitely need to start with a sketch. At first draw a long and squirming figure. You can carefully redraw every curve of the body of our lizard. An important point – the body should taper slowly in the direction of the tail. As always we move from top down, in this case from the head to the tail. In this step we outline the contours of the ears, horns, dashes. Denote the position of the eyes and draw the ornate and twisted mustache. 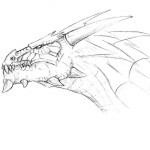 And now, dear artists, to draw the face of the dragon, delete all guidelines and circle over his mustache – a mustache considerably narrowed from the nostrils to the tips. In general, a simple step, perhaps, the eyes can cause a little trouble. Be very careful, when you draw the eyes. Mouth should be dotted with small, sharp teeth, so now we draw them. Further draw the ears with pointed edges of the hair. Here we draw the horns of Chinese dragon, it should have smooth, graceful curves. Yes, Chinese dragons have very specific appearance. By the way, we have a drawing tutorial on how to draw Gon from Tekken. Those born to crawl will never fly? Our dragon, as you can guess, can both crawl and fly. And to show it, you need to draw his paws. More precisely, not draw, but only to outline. Incidentally, in this steps his paws look like chicken legs. Chinese dragon Is slimy and disgusting? Not at all, it is – soft and fluffy cutie, as cute as hopes for a brighter future with the old man Mao. 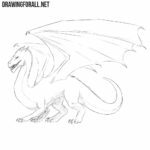 The upper part of the body of our dragon really fluffy and covered with fur, so you should draw it. Draw strokes on the upper line of the body, to make the Dragon more “fluffy”. Draw the tuft on the tail. 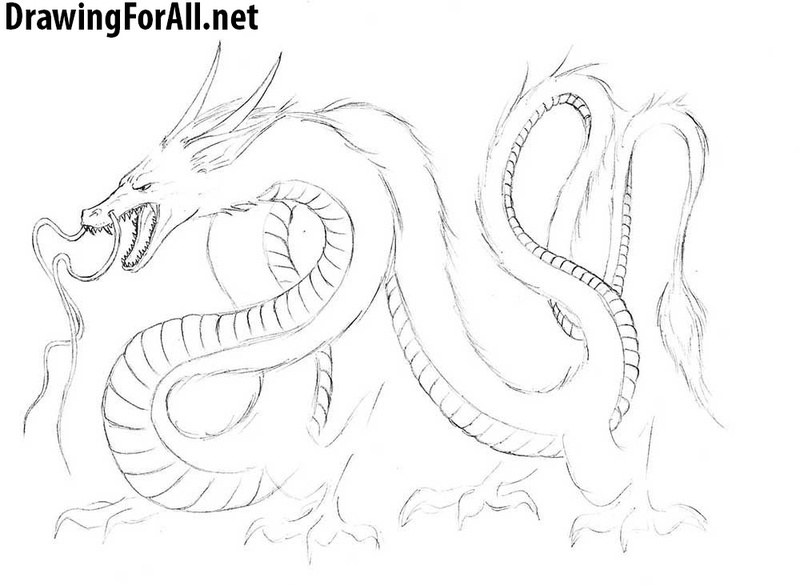 Draw horizontal segments of the inside of the body of our Chinese dragon. Note, that the segments become closer to each other in the end of the tail. 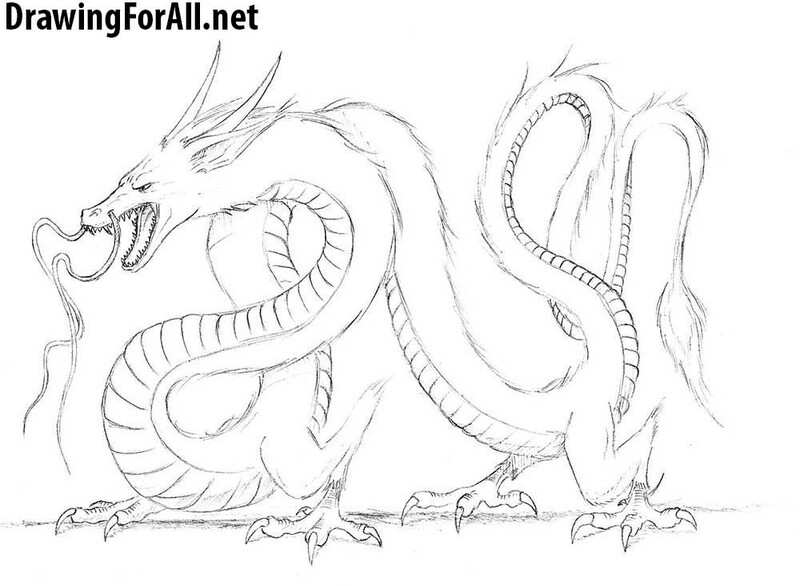 During the step in which we outlined the paws of Chinese dragon, they were very similar to chicken legs. So now they will become even more similar to chicken legs, because we draw sharp, curved claws down and outline the folds of skin. Draw small shadow on the surface, as well as shaded areas of the body that are most closely located to the paws. Yes, here is no complex shade structures, on the shadow places just need to add some hatching with a pencil. 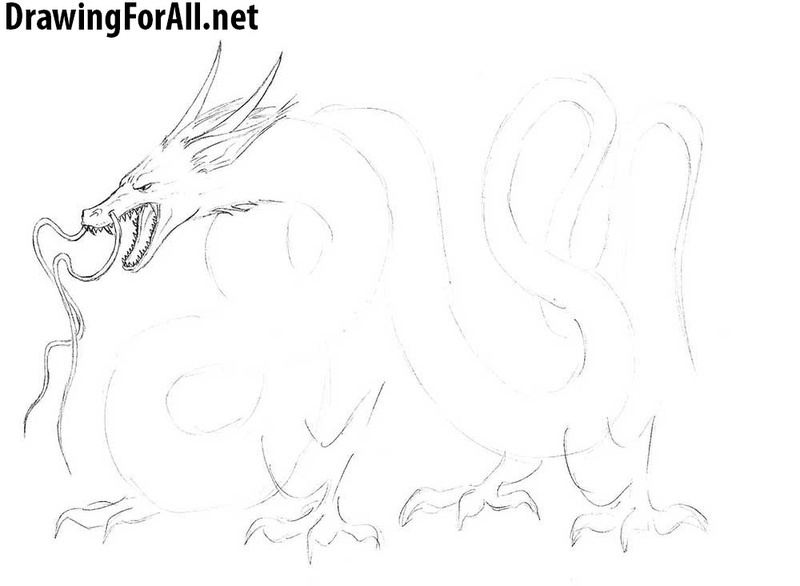 It was a drawing lesson on how to draw a Chinese dragon step by step, prepared for you by artists of DrawingForAll site. Do not forget to subscribe to us in Google Plus, FaceBook, Pinterest and others, to keep abreast of all new drawing lessons!